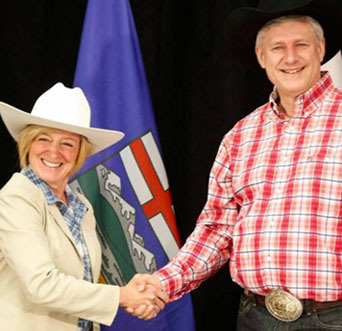 Alberta NDP Premier Rachel Notley welcomes then Conservative PM Stephen Harper to Calgary Stampede, July 2015. GANATSEKWYAGON, ON., MAY 24. [UPDATED 1 PM ET]. According to CBC poll analyst Éric Grenier’s latest calculations, the rounded-off polling averages for Ontario election 2018 are now Ford Nation PCs 37%, Andrea Horwath New Democrats 36%, and Kathleen Wynne Liberals 21%. 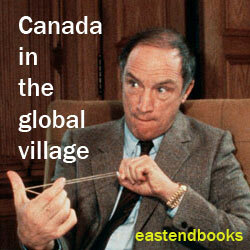 Warren Kinsella has also stressed that the PC vote “is spread out in a way that is more efficient” than the NDP vote. And Éric Grenier’s latest calculations are still suggesting a PC majority government of at least 63 of 124 seats in the legislature. It is still not exactly easy to believe that a government led by Andrea Horwath is finally going to be the result when all the votes are counted on June 7. Grenier’s May 24 poll averages nonetheless suggest that both Liberals and PCs are losing ground, while the New Democrats (and to a much lesser extent Mike Schreiner’s seldom-noticed Green Party) are gaining. From an Ipsos poll released May 9, 2018 when the official election writ was dropped in Ontario and the sign campaigns began. At the same time, there are moments when I wonder whether what’s happening in Ontario right now is actually coming very close to Stephen Harper’s old dream of a Canadian political system that congenitally pits Conservatives against New Democrats, who the majority of voters are finally bound to view as unrealistic socialist utopians (or something of that sort). There may or may not be some prospect that the leaders’ debate on TV this Sunday, May 27 (6:30 to 8:00 PM) will add a fresh edge to the race. Meanwhile, I am hoping that Mr. Harper’s old dream remains locked in the closet to which it was consigned by the 2015 federal election. 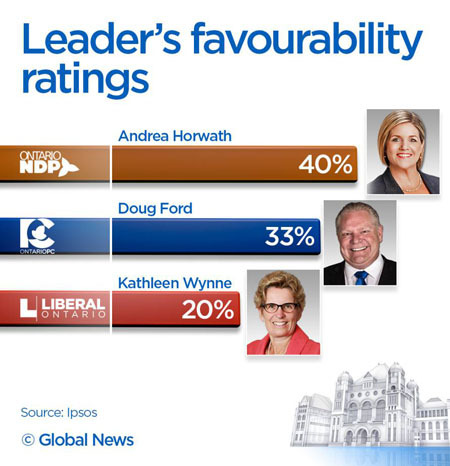 While I continue to wonder and wait … wait and wonder … (and remain personally convinced that a Premier Horwath could certainly not be any worse than a Premier Ford).